Documents filed by the Crown in support of its breach-of-trust case against Vice-Admiral Mark Norman provide some intriguing — and occasionally profane — details of a navy procurement process going off the rails. "FFS keep me out of this." If you're in politics or news media in Ottawa, you've seen that well-worn, profane phrase pop up in your in-box from time to time. The Crown put those words — culled from an email allegedly written by the former head of the navy in the early hours of Nov. 20, 2015 to now-former CBC journalist James Cudmore — in bold type as it laid down the foundation of its criminal breach-of-trust case against Vice-Admiral Mark Norman in documents released late this week. It was — in the estimation of prosecutors Barbara Mercier, Mark Coven and Jeannine Plamondon — a recognition by Norman that he was in "in the wrong." What he allegedly did wrong, according to the court filing released Friday, was provide information about a Liberal cabinet decision to halt a $668 million leased supply ship contract for the navy to both the shipyard involved and the media. Significantly, the Crown's court brief — which contains extracts of emails and text conversations seized by the RCMP in the course of their investigation — expands the scope of the claims against Norman to include allegations that he breached cabinet secrecy on 12 separate occasions. None of the information contained in the 76 page filing has been tested in court, nor have any of the documents cited been entered into evidence. Norman, the former vice chief of the defence staff, is charged with one count of breach of trust. "Mr. Norman knowingly and deliberately leaked this information. In various communications, he acknowledged this information was privileged and confidential," said the filing, the latest legal salvo in this high-stakes political drama. "Moreover, the content of his communications demonstrates that he knew the use to which the leaked information would be put by Davie, Davie lobbyists and the media." The Crown alleges Norman leaked information — including behind-the-scenes details related to the supply ship program and the cabinet discussions about it — to an executive at the Davie Shipyard in Levis, Que., using his personal Gmail account. The leaks, according to court records, started on Oct. 3, 2014 and continued into November 2015, when the future of the project was hanging in the balance. That timeline covers a much longer period than the original allegation did, and includes months before and after the former Conservative government signed a letter of intent with the shipyard to lease the badly-needed vessel. The newly-elected Liberal cabinet moved on Nov. 19, 2015 to put the project on hold, but word leaked to the media and Cudmore broke the story. The decision was reversed days later after a political controversy erupted. Furious, the government ordered an RCMP investigation after an internal probe failed to pinpoint the leak. The Crown submission quotes from emails Norman allegedly wrote and claims he was the primary source of Cudmore's story. 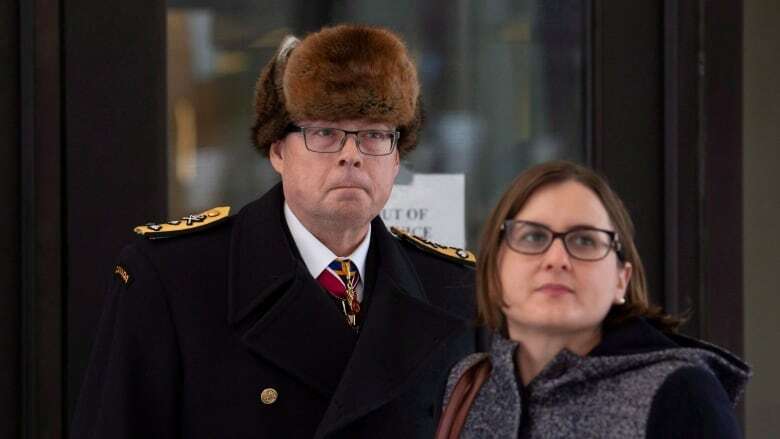 "This case will come down to to one issue: whether Mark Norman's repeated, continuous, covert leaking of confidential information to Davie and the media was done with criminal intent," said the court documents. "We say it was because, by his own words and by ready inference, his conduct was designed and intended to dishonestly corrupt and oppress the decision-making process of cabinet, the principle of cabinet confidence and the lawful and accountable decision-making process to be followed by civil servants." The Crown did not release actual copies of the emails as part of its submission. But the quotes it shared with the public pull back the curtain on the nasty (and sometimes personal) political and bureaucratic battles that went on over the supply ship contract. At one point, the documents allege, Norman and Davie executive Spencer Fraser conspired to discredit the head defence procurement official, retired rear-admiral Pat Finn, who opposed the lease plan. Another email allegedly quotes Norman taking a profane swipe at former chief of the defence staff and retired general Tom Lawson, who apparently did not support the project either. Dave Perry, a procurement expert at the Canadian Global Affairs Institute, said that if anything, the emails reveal senior levels of the federal government are like workplaces everywhere — where frustration with the boss is "not necessarily PG material." He said we are only getting snippets of conversations in the court filing — not enough to evaluate the strength of the Crown's case. "I would reserve judgment on the overall intent [of Vice Admiral Norman] until I see what's actually behind this," Perry said. The legal bar that the Crown will have to meet in order to prove a breach of trust has been set fairly high by the Supreme Court of Canada. In 2006, justices on the high court said prosecutors must prove not only criminal intent but also personal benefit to the accused. Retired colonel Michel Drapeau, a military and access-to-information law expert, said evidence meeting that standard was not spelled out very clearly in the Crown's court filing, but may become evident in next year's trial. Proving that Norman had something "personal and material" to gain is "absolutely crucial," he said. Prosecutors said many of the issues touched on in earlier court filings — such as the claims of political interference raised by Norman's defence team, headed by Toronto lawyer Marie Henein — are irrelevant. The Court "should not wade into the realm of politics to second-guess the decisions of ministers, cabinet or government on non-legal issues," the Crown's submission said. There are well-established mechanisms for officials who disagree with cabinet decisions, and the Crown submission even suggests at one point that Norman could have become an official whistleblower within the system. "The defence's position that Mr. Norman's conduct in secretly releasing confidential information could somehow be excused because he felt civil servants were not doing what he thought was in Canada's best interest, or what individual ministers wanted them to do, is remarkable to say the least," the submission said. "This Court could never countenance an irresponsible, unlawful approach to dispute resolution that would see a senior member of the military ignore his lawful duties and instead embark on an agenda of subterfuge and deceit." Conservative MP and former cabinet minister Erin O'Toole said he was surprised to see the scope of the Crown's case open up to include the former government. And that, he said, makes the release of the government documents sought by Norman's lawyers even more important. "I was intimately aware of a decision with respect to an interim [supply ship] and saw zero influence on the process by Mark Norman," O'Toole said. "I would be happy to waive and be involved in waiving cabinet confidence in relation to the Conservative cabinet's decision. And I know former prime minister Stephen Harper would be as well."